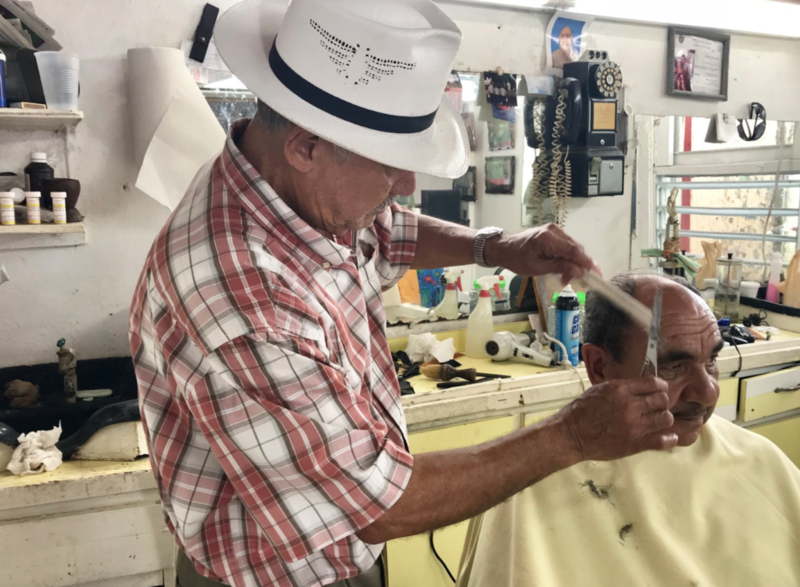 The custom of barber shops and beauty salons closing on Mondays for a day of rest does not apply at the Pérez Barber Shop in Adjuntas, a municipality of almost 20,000 people located in the center of Puerto Rico. At this small business, founded over four decades ago, neither lack of water or power have been able to silence the hair clippers or halt services for people who regularly come by the shop. 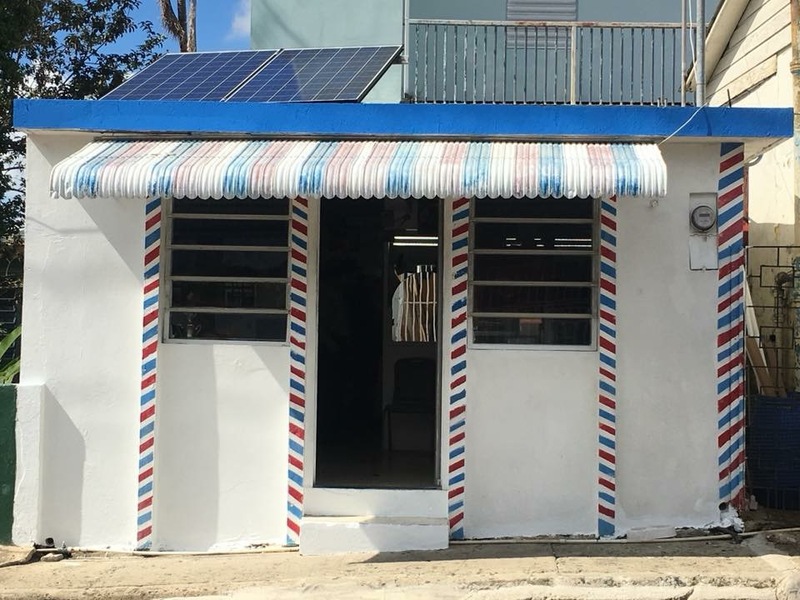 While Hurricane Maria destroyed Puerto Rico’s old electrical power infrastructure, leaving the majority of the population without electricity for months, and thousands without service to this day, Wilfredo Pérez, saw his barber shop reborn thanks to the help of Casa Pueblo, a community-managed initiative that offered to install solar energy for his business. “After Casa Pueblo installed the solar panels, I haven’t had any problems. I work all the time,” said Pérez. As a TV played in the background, Pérez said that the solar energy has not only reduced his electrical bills to practically zero, it has also added value to his business. On September 20, 2017, Hurricane Maria left almost 80 percent of the Puerto Rico Electric Power Authority (PREPA), distribution lines on the ground and many areas of Puerto Rico without power for months. As a result, the majority of businesses had to close, hospitals had difficulty taking care of patients, and the country was left in darkness. 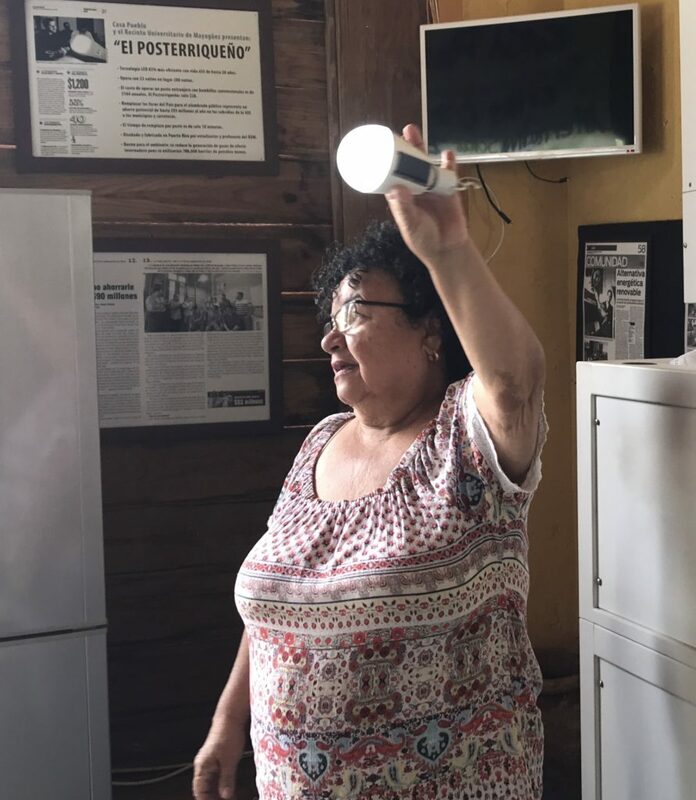 But amidst the darkness, the environmental organization Casa Pueblo shone with its own energy, lighting homes and businesses like Pérez’s, and starting a debate on the island, and beyond, about the viability of solar power as a sustainable energy alternative. Casa Pueblo was founded in 1980 to oppose mining projects that threatened the local environment. In 1999, the group installed 35 photovoltaic panels, a charge regulator, 12 batteries and an electrical current converter in a large, old house in the town center of Adjuntas. The power generated by the panels is transferred to batteries where it is stored for future use. The system has allowed the organization to generate its own electricity, without having to depend on the PREPA’s national grid, unlike the more than 10,000 residences with solar panels on the island that did not have batteries, who were left in darkness after the hurricane. 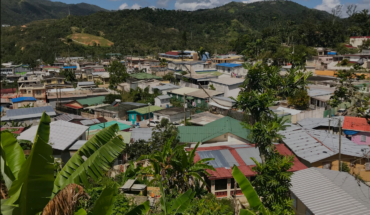 After the hurricane, Casa Pueblo distributed 14,000 solar lamps, lighting 70 percent of the houses and businesses in Adjuntas. So far they have been able to retrofit 10 houses with photovoltaic systems, and they are in the process of ensuring that more than 50 homes are energy self-sufficient. In other words, that they run on 100 percent solar power. 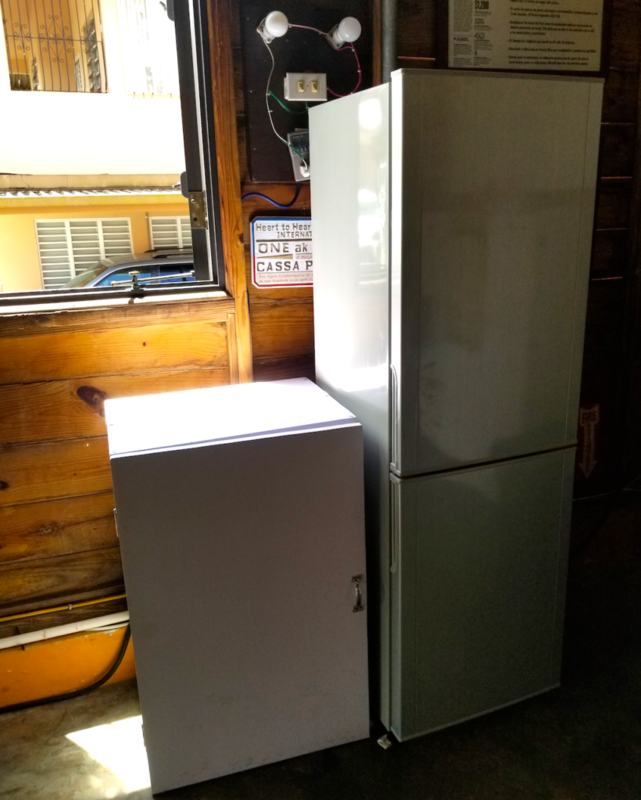 They also built 54 small 12V solar refrigerators for 10 families that need to refrigerate their medicines, which allowed them to continue their respiratory therapies or dialysis after the hurricane. Casa Pueblo also distributed solar fridges to small grocery stores in remote areas, allowing the residents to keep their food refrigerated. The organization gave out solar lamps in Utuado, Jayuya, Humacao, Loíza, Vieques, and Salinas in addition to 200 roof tarps, around 1,500 water filters for those who did not have potable water, and access to satellite phone service for the thousands of Puerto Ricans that were left without cell phone service. Surrounded by mountains and greenery, Casa Pueblo is at the heart of the town of Adjuntas. Students, children, local visitors, and tourists come to the house with the pink facade that has meeting halls and exhibits, a library, an artisanal shop, an antiques room, a hydroponic garden, a butterfly farm, a radio station, and a movie theater — all operated with solar power. In the main room of the house, solar fridges and batteries, environmental awards, and front-page articles that describe the organization’s fight are displayed like trophies. Sitting in the main room, Massol explained how Puerto Ricans living on the U.S. mainland have embraced the initiative, allowing Casa Pueblo to expand their efforts. “We were able to make a collaborative arrangement with North American institutions in the cultural centers of New Jersey, Chicago, and many places through the Puerto Rican diaspora,” he said. Among the first to respond to the call was Marian Cabanillas from the organization Texas United for Puerto Rico. The group of Boricuas (Puerto Ricans) organized medical professionals and collected more than $2-million in medicine, solar lamps, and medical equipment. When Cabanillas’s house became too small to store the aid, the group found a warehouse in the city to store everything they had collected, before sending the shipments to Puerto Rico. But there was concern that the supplies might not get to those who really needed them due to the instability of traditional mail service on the island. Ultimately, they sent thirteen small planes and two cargo airplanes over the course of three months. “There always had to be one of the members of the organization on the plane and Arturo Massol [from Casa Pueblo] at the airport ready to receive the supplies,” said Cabanillas. The organization also created a fund to help small businesses and to build homes in Puerto Rico. Other organizations from the mainland U.S. that have collaborated with Casa Pueblo include the Sierra Club, Grassroots Boston, JPB Foundation, David Galarza NY Foundation, and a number of universities. On the island, national organizations such as the Puerto Rico Recovery Fund and Resilient Power Puerto Rico have also collaborated. The immense social and economic impact caused by the failure of the national power grid after Hurricane Maria raised questions about the ability of traditional energy to meet the needs of the island. After witnessing what Casa Pueblo has accomplished in the midst of one of the biggest blackouts in history, many people see solar energy and energy independence as a more viable and sustainable alternative. Javier De Jesús Martínez, architect and designer, and director of the Center of Collaborative Innovation at Universidad del Sagrado Corazón said Casa Pueblo has always been a visionary project. “It would seem that they are talking about an issue that’s light years away. But there are things, problems or opportunities that we are going to tend to directly [in the present or in the near future],” said De Jesús. “More than innovative, [Casa Pueblo] is a precursor.” Others are not as optimistic, pointing out that the Puerto Rico Electric Power Authority remains committed to burning fossil fuels to generate electricity. In the last few years, Casa Pueblo has led projects including the Posterriqueño, a public lighting system using LED lamps that reduce power consumption by 55 percent compared to traditional street lighting; Radio Casa Pueblo, a community and ecological radio station; and models of forest conservation and sustainable economy like Café Madre Isla. Since Hurricane Maria destroyed the island’s obsolete energy infrastructure, Casa Pueblo’s goal has been to derive half of the island’s energy consumption from the sun, replacing fossil fuels. The organization also seeks to create electrical microgrids, where entire neighborhoods can generate their own power, independent of the instability of the PREPA’s national power grid. 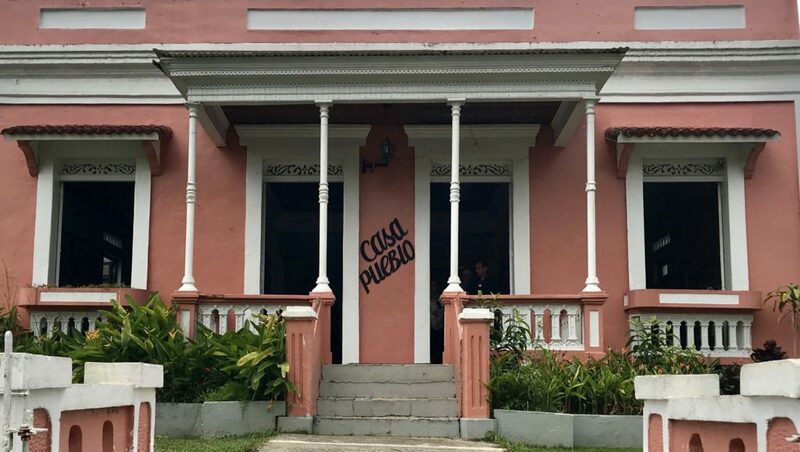 Casa Pueblo’s proposal, added De Jesús, is to diversify the power structure and show Puerto Ricans that this is an opportunity. Walking through Casa Pueblo’s central corridor, you can see a structure in the backyard right next to the butterfly farm. From the outside, through the glass divider at Radio Casa Pueblo, a man smiles as he plays Latin music. 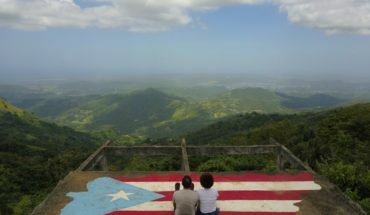 The radio station, Puerto Rico’s only solar-powered radio transmitter, kept the mountain-area community informed before, during, and after the emergency. For Osvaldo Santiago Robles, radio announcer and producer at the station for 10 years, this was an historic experience. It was not the first time he had stayed through the night at the radio station, but the announcer said that he experienced a magical sensation when he was on the air while other stations could not broadcast. 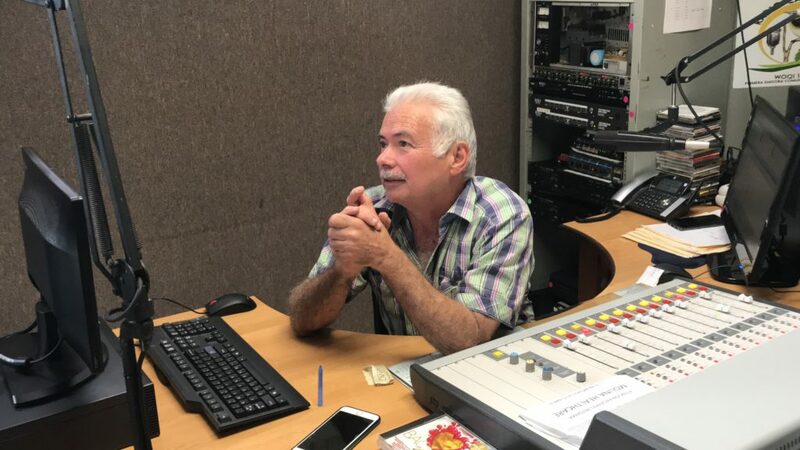 Santiago Robles, a lover of salsa, bachata, and even reggaeton, said that the solar radio station not only informed the community during the emergency, but they also were able to share a bit of joy through music. “It’s like they say, ‘a country without music is a country without a soul.’ Because music is the soul of every town,” he said nostalgically. The radio station’s success allowed Casa Pueblo to open the first solar-powered movie theater in Puerto Rico last April. The theater, located in the large [Casa Pueblo] house, has 71 seats, a big screen, a high definition projector and a Dolby sound system. Maribel Hernández, a Casa Pueblo guide, said that the purpose of the movie theater is to not just to provide a space for recreation and entertainment. “With solar power, we have been able to advance our [environmental] battle and take it to another level,” Hernández said. Movies that have been shown include the documentary “Nuyorican Básquet,” a dramatic story about Puerto Rico’s 1979 National Basketball Team, whose players were mostly born or raised in New York City. During May, the listings included a documentary about the environmentalist Berta Cáceres. Meanwhile, PREPA is dealing with the crisis with $14-billion in debt and an infrastructure that’s nearly three times more outdated than the average electrical infrastructure [on the U.S. mainland]. In May, PREPA’s new Executive Director said that the public agency will adopt the American national standard to design and rebuild the island’s power grid after Hurricane Maria. Close to two billion dollars from the Recovery Fund for the island are designated for power grid reconstruction. Only $36 million will be used to develop renewable energy projects, according to Puerto Rico Governor Ricardo Rosselló’s plan for the use of new federal funds for the reconstruction of the island. 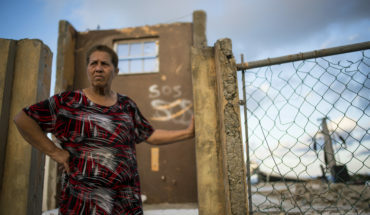 Nearly eight months after the hurricane, in the middle of May, more than 16,000 Puerto Rican residents continued to be without power, and the island still suffers from constant blackouts. 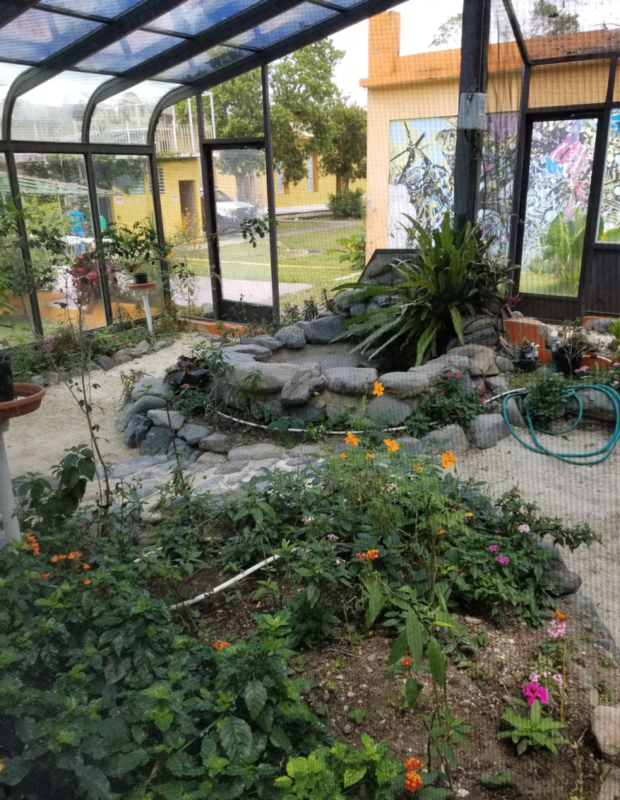 At the same time, Casa Pueblo’s headquarters in Adjuntas remains open day after day, offering basic services, education and independent training on the problems facing the national electrical power grid, making it a true energy oasis. Journalism students, Kathleen Centeno and Imalay Cruz, contributed to this story. Kathleen Centeno has a bachelor’s degree in journalism from Universidad del Sagrado Corazón (USC), San Juan, Puerto Rico. Imalay Cruz is a student of journalism at Universidad del Sagrado Corazón (USC) with a minor in psychology and music.